Before you read this post, you should probably know I’m predisposed to loving rodeos — they were regular outings for folks in Georgia, from which I hail! But, my first rodeo was actually in Boise, Idaho when I was in my 20’s, and the experience got me hooked. Now, it’s my turn to pay it forward and let others know how much fun rodeos can be — especially in Hawaii, where the tradition of the paniolo (Hawaiian cowboy) is still alive and well. 1. Rodeos are a part of Hawaii history: Back during the paniolo days, Hawaii ranches also produced some of the greatest cowboys of all time, the best remembered of whom is Ikua Purdy, winner of the 1908 World Roping Championship at Cheyenne Frontier’s Day. In fact, in 1999, Ikua Purdy became the first Hawaiian ever voted into the National Rodeo Cowboy Hall of Fame. Aside from Purdy, notable Hawaiian cowboys were known for their prowess in the rodeo ring. Eben Low always said Hawaiian cowboys were the world’s finest because they dealt primarily with wild and feral cows. Rodeos present great opportunities for families to not only see, but experience horses first hand. 2. Rodeos are family-friendly: Unlike so many “grown-up” events that are off-limits to those under 18, a rodeo is a great place to take the keiki (children). The last time we attended a rodeo on Kauai, my children were glued to the event ring and couldn’t take their eyes off the action. Of course, the shave-ice stand behind the bleachers didn’t hurt, but suffice it to say that a rodeo is an action-packed event that will contain your childrens’ attention for a good, long, while (which is often worth its weight in gold). 3. A rodeo is a good education: If you’ve always wanted to expand your horizons a little, you can learn a lot from attending a rodeo in Hawaii! Do you konw what Double Mugging Calf Roping is? (this is basically a half grown Bull Calf weighing at least 300 pounds or more. You have one cowboy on the horse to rope the “calf” and one person at the end of the arena who then comes over once the horse and rider have stopped to wrestle it to the ground and tie the feet together. Six second hold and a 120 second time limit.). How about steer decorating or mutton busting? Let’s just say you can learn a lot from one afternoon at the rodeo! 4. Rodeos are interactive: At nearly all the rodeos our family has attended, you can always find a fun activity in which to participate. On Kauai, most of the rodeos have a pony-riding ring for keiki who want to try their hand at being a paniolo. Other rodeos feature areas where you can learn to rope, feed horses, or participate in crafts associated with horses and cattle. 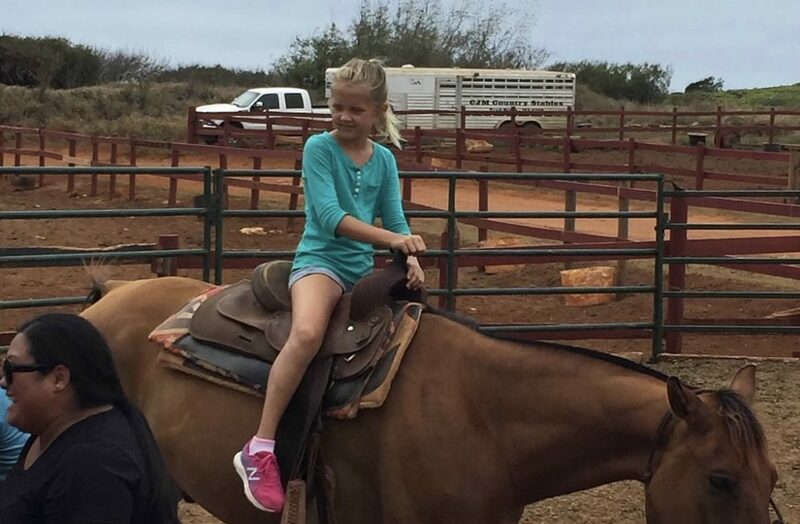 Want to learn more about horses, like what they eat, visit one of Hawaii's many rodeos. 5. Cowboy hula: Everyone back at home expects you to return with stories of fun in the sun, but they WON’T expect a story about cowboy hula! The last and final event during a rodeo in Hawaii is usually the Cowboy Hula. A bull is let loose to chase a cowboy in a hula skirt to Hawaiian music and hopefully doing some semblance of a hula dance while running. Yes, it is as funny as it sounds, and the crowds love it. The next rodeo in Hawaii takes place on Kauai February 24-26 in Waimea for the Waimea Town Celebration, and it’s your opportunity to see this exciting event up-close. 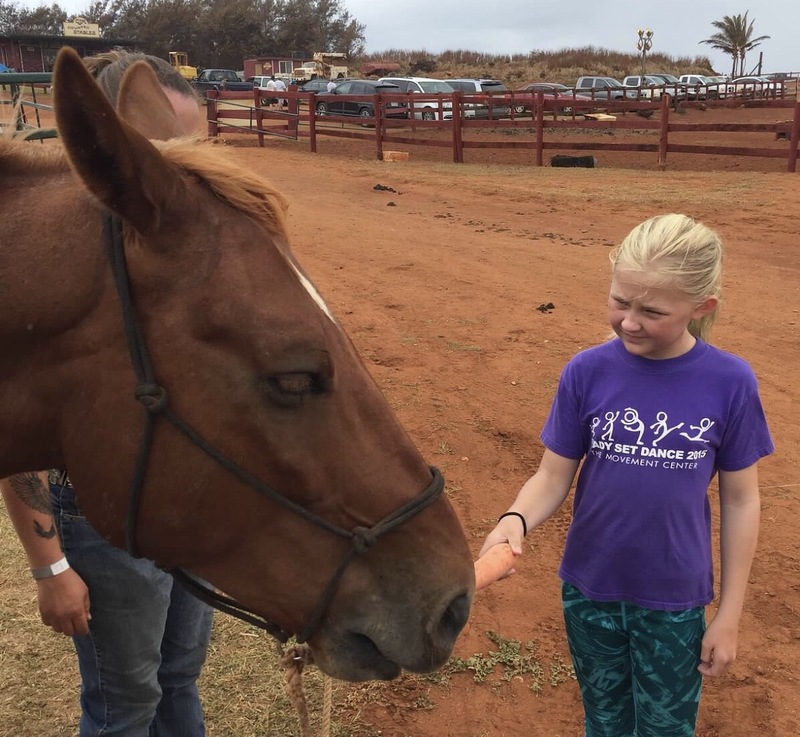 In fact, if you book a Kauai Jeep Tour during this weekend, you can even ask your guide to make a stop at the rodeo, so you can check it out (all tours are customized to the guests’ requests). However, if you miss this one, you can always find a rodeo to attend (they usually take place every couple of months). I can’t say enough good things about rodeos in Hawaii — they’re fun, educational, and family-friendly. So, grab your 10-gallon hat, and I’ll see ya there!